What better way to make your day go smoother than purchasing one of our advanced Tickets for the Hornsea Biker Event Ride in, present this ticket upon arrival and you will be award a Prostate Cancer Pin to tell others you support this amazing charity. And here is the real special part of this purchase..
We leave at 10.30am Sharp on Sunday the 26th of August 2018, and feel free to arrive from 7am Hornsea Garden Centre will have Hot Food and Drink in the cafe for you to buy. All proceeds from the Hornsea Biker Ride in are donated to Prostate Cancer UK. So the more the merrier, tell your friends, lets get as many as we can signed up for the day. So what is Prostate Cancer. “Forget the stigma of what goes on for the testing and forget being macho. If you want to live, go and get tested and keep getting yourself tested.” Words from a survivor it’s just a blood test to begin with and could save your life. Prostate Cancer is the largest men’s charity in the UK, which has now taken over from women’s breast cancer as the biggest killer. 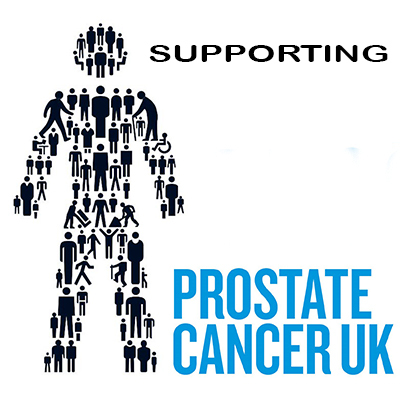 1 in 8 men will get prostate cancer at some stage in their lives. 1 in 4 of these will die from the disease. Are you at risk of getting prostate cancer? You may be more likely to get it if you are over 50 as the risks increase with age. If your father or brother has had it, you are two and a half times more likely to get it. If you are black the percentage raises to 1 in 4 getting it, or if you are overweight you may be at a higher risk too. The changes you should be looking for are, needing to urinate more often than usual especially at night, difficulty starting to urinate, straining or taking a long time to finish urinating, a weak flow when you urinate, a feeling your bladder hasn’t emptied properly, a sudden need to urinate-sometimes leaking urine before you get to a toilet, dribbling urine after you finish urinating. Other less common changes are pain when urinating or ejaculating.